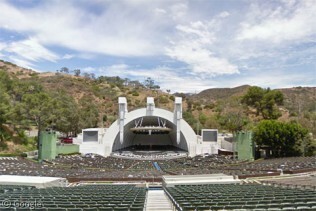 The Hollywood Bowl is a modern amphitheatre in Hollywood, California. Officialy opened in 1922 it was built on the site of a natural amphitheatre known as the Daisy Dell and is used mostly for music performances. The Hollywood Bowl is well known for its band shell, a distinctive set of concentric arches that has graced the site since 1929. Popular entertainers including Frank Sinatra, the Beatles, and Judy Garland have given famous or noteworthy performances under the shell. Cartoon buffs may see a resemblence between the concentric arches of the shell and Porky Pig’s backdrop in Th-th-that’s all, f-f-folks; it is debatable whether it was intentional (however, the Bowl did make appearances in various Warner Brothers cartoon shorts, and at least one DePatie-Freleng Pink Panther cartoon).